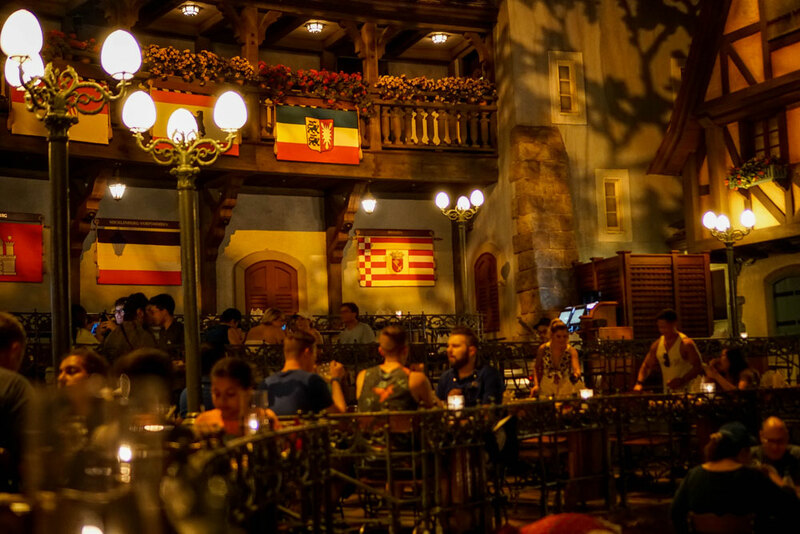 After my first experience dining inside Epcot’s Biergarten a few months back, I was left extremely curious as to why I hadn’t heard more about this immersive buffet experience from the Disney community. 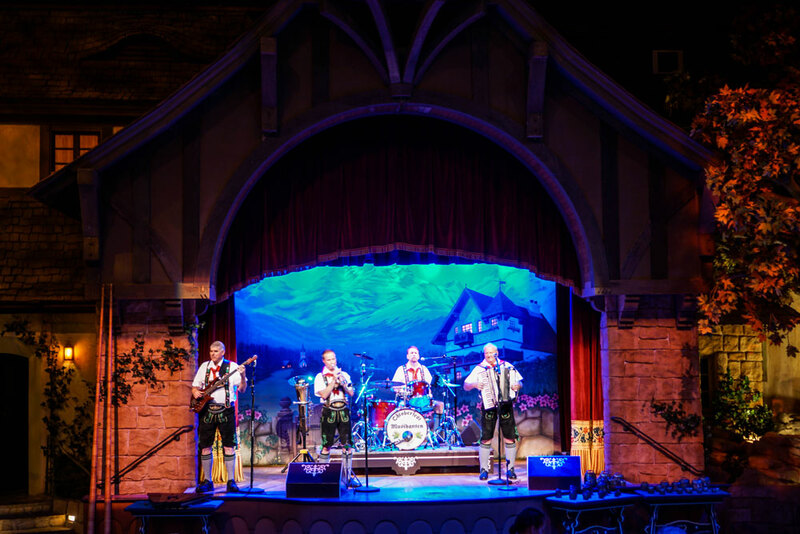 Quick correction, I should say dining outside at Epcot’s Biergarten, as the entire restaurant is inspired by and themed towards an evening spent at an outdoor German beer garden. 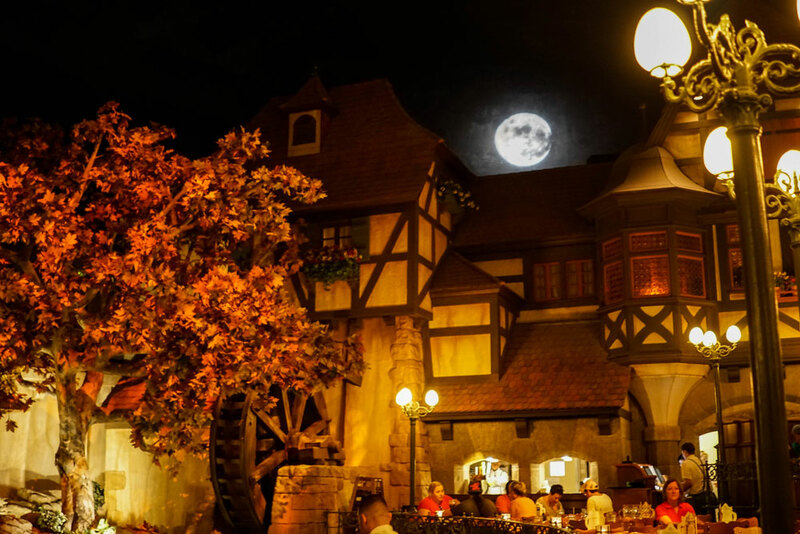 So I rendezvoused with fellow World Showcase travelers Pete Werner and Steve Porter, and we promptly prepared to transition from the sweltering early afternoon Florida rays into the cool, quaint moonlit comfortability of an autumn night in Epcot’s slice of Germany. 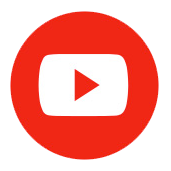 *You can find our video review embedded at the bottom of this article, or check out the Disney Dining Show and see all our reviews, topics, and discussions. We deftly slid through the crowds gathered in the small yet visually grand courtyard of the Germany pavilion, rapidly making our way to the shaded check-in area of Biergarten. 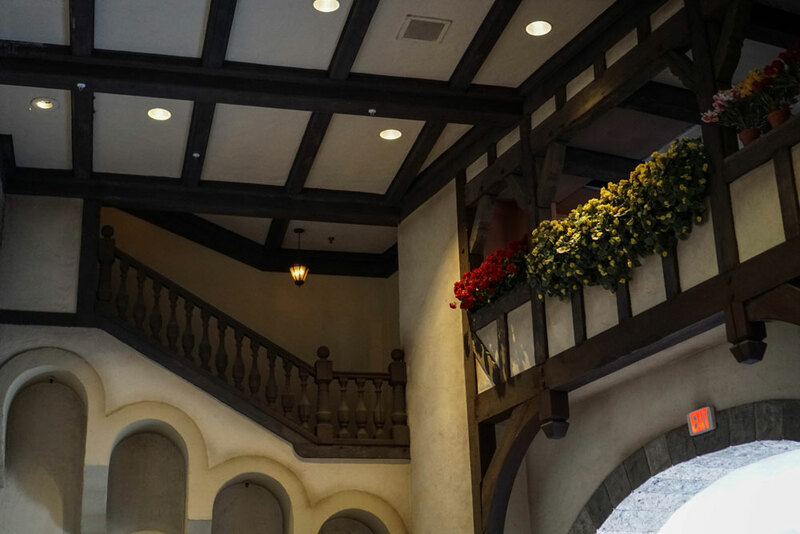 Not only does the waiting area have much-desired shade, it is beautifully crafted to simulate the wood and stonework of an old German building, complete with decorative flower boxes along the wall. Our meal was mid-afternoon on a Friday, and although the hostess prepared us for a 10-minute wait, I don’t think we were there for a full 5 before we were lead to the restaurant’s interior. Upon entrance, a hostess will politely and enthusiastically give you the rundown of how meals at Biergarten play out. In the tradition of Oktoberfest beer hall revelry, you’ll most likely be eating and drinking alongside strangers. The tables are long and meant to include multiple groups, or one very large one. As there were only three of us, we were sat with another family of three and eventually joined by another mother and child. My feelings on this were complex. You see, this aspect of the restaurant didn’t bother me this time because I knew it was coming and was prepared to wrap myself in the warm comforting blanket of work. As I was dining on the clock, I didn’t feel guilty about making zero effort to socialize. Pete and Steve were somewhat less prepared — admittedly I forgot (purposefully neglected) to remind them — and they found the situation exceedingly awkward. If I think back to my first trip a few months ago, I remember absolutely hating the forced socialization for the first half of my meal. The thing is, I like to choose the time and place to make new friends, and I dislike small talk. Sure, I’ll end up talking to strangers in the parks all the time, but those conversations happen organically. Being sat with a random group of people that I may or may not have anything in common with, under the implication that I either attempt friendship or seem misanthropic, reminds me of the first day of grade school. I don’t like that feeling. This seating style was the hugest strike against Biergarten, by far. Although the family of three seemed to be enjoying themselves thoroughly, they showed absolutely no interest in getting to know us — I loved them for that. There was one point during the meal, though, where the mother was scolding her child. Now, I don’t like to judge other people’s parenting, but that’s kind of the point; we were seated right next to each other, so I couldn’t avoid it. She bore the full brunt of self-righteous mental armchair parenting that can only come from the mind of an extremely annoyed childless reprobate like myself. I didn’t say anything though; I just thought at her really hard. It didn’t ruin our experience, but a more intense version of the same situation easily could. Biergarten is, without a doubt, one of the most immersive restaurants on property. Similar to the oft-maligned San Angel Inn, the interior simulates a night outdoors in a wondrous foreign setting. I don’t have much real-world context for the theming; I can’t claim to distinguish my Prussia from my Bavaria. All I can say is that the setting is crafted to be both grand and comfortable. As you enter the grand hall toward your table, you’ll notice that the seating is set up in a tiered, almost stadium-style gradual drop towards the stage. This not only gives everyone a fantastic view of the entertainment to come, but truly reinforces the open air nighttime illusion. The deeper in the amphitheater you are, the higher the ceiling vaults, so that the simulated sky effect is efficiently established. This lowered seating also causes you to look above at the surrounding architecture and feel safely enclosed in the small German village. Not only are you surrounded by cottage-style buildings, but an interior tree boasting pink autumn leaves graces the facade of a wooden mill house brilliantly accented by the full moon. Any gripes I could make about the social awkwardness of group seating quickly dissolved, washed away by the expert theming of the enveloping dining area. 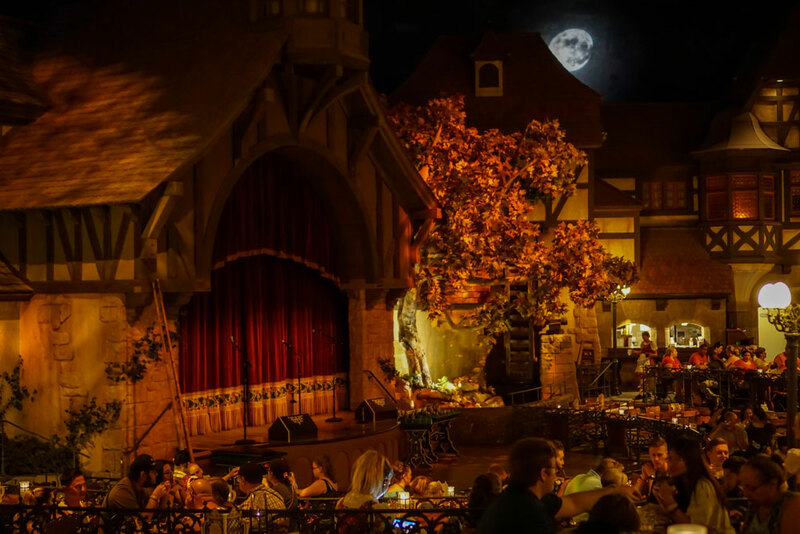 If I had to put my finger on why I find Biergarten’s manufactured nocturnal environment so special, I’d say it’s that it replicates the charm of a classic Disney dark ride. I’m sure that when fully illuminated, the immersion is lost and it looks just like a set. During its dimly lit operation though, the effect is captivating. After your drink orders are taken, your server will direct you towards the buffet area, located on the top level right around the corner from the entrance. Biergarten is, of course, buffet dining. 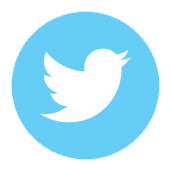 With that comes its own set of expectations for food quality and service. While I’ll give a few highlights of the cuisine in the following paragraphs, there is one thing I must note. 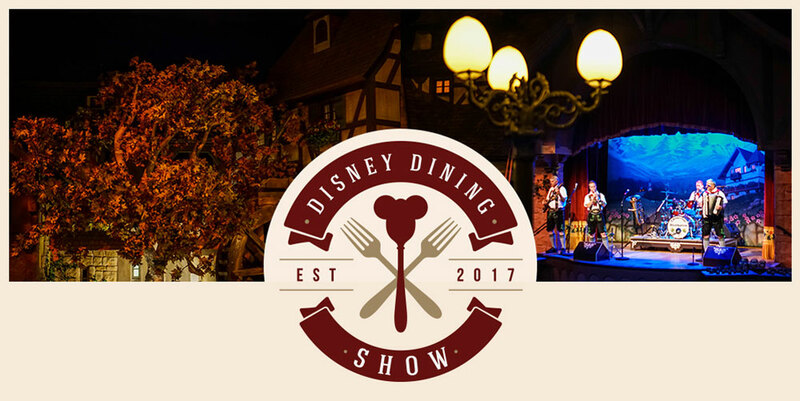 I have dined at Biergarten in both early and late afternoon, once on the first day of the Epcot International Flower and Garden Festival. I have yet to see a substantial crowd, and waiting in a packed buffet line has not been an issue. The process to fill my plate and make my way back to the table was brief and uncomplicated on both occasions. Let’s get this out of way right now — if you are a vegetarian, or on any other no-meat diet, you will not enjoy Biergarten. Peter and Steve found the traditional salad offering to be wilted and low quality, not to mention that the only available dressings were of the tarragon or creamy herb variety. I myself never even bothered to throw any of the sub-par leaves on my plate, because German food is all about the meat and carbs. 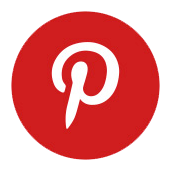 There are other non-meat salad options, such as potato, pasta, cucumber, cabbage, or mushroom salad (my personal favorite salad option), but there probably aren’t enough dishes to fill the belly of the vegetarian or vegan in your crowd. Peter is currently operating under a Keto diet, so carbs are to be avoided at all cost, and he did manage to have a satisfying dining experience. Qualifying for the salad list on a technicality was the sausage salad. While Peter and Steve both abhorred this cold diced pickled sausage, I happened to enjoy it quite a bit. The flavor is unique, and I can easily comprehend why the average person would not enjoy it. I’d recommend that you only put a bite or two on your first plate, just to be safe. That was the last serious meat-related complaint, though, and from the cold cuts on, things started to improve drastically. Although their German Sausage and Sauerkraut, along with other sausage selections, was not the best you’ll ever come across outside of the Rhineland, both Peter and I found it to be much better than expected. Steve wasn’t sure if he had set his bar too high, or if the buffet style of serving just left the temperature too lukewarm for him; either way, he wasn’t as impressed. I thoroughly enjoyed the seasoned potatoes as an accompaniment to the massive amount of meat I was ingesting. The highlight of Steve’s afternoon, aside from some delicious pretzel rolls, was the Salmon with Mustard Dill Sauce. The Pork Schnitzel and Hunter’s Sauce were incredibly pleasing to my palate, while Peter threw accolades at the Roast Chicken and, above all, the German Meatballs. 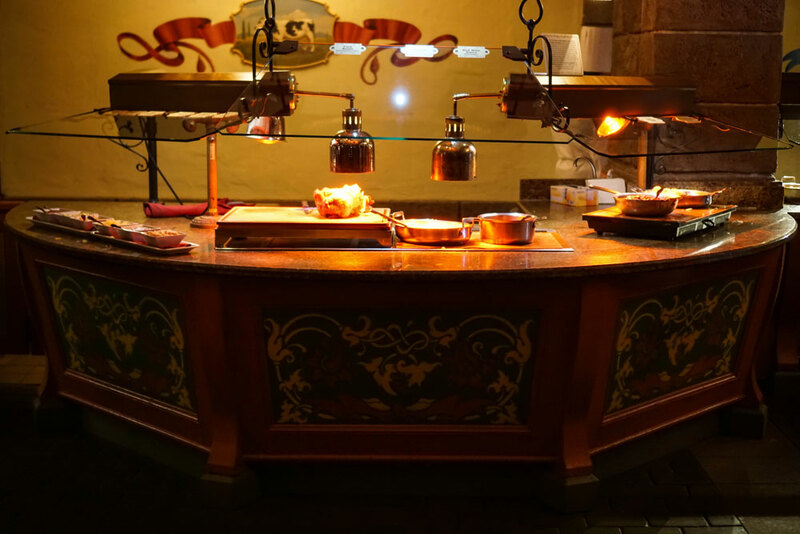 As is tradition in buffet culture, this appetizing assembly line ends in a carving station. On offer for our afternoon was Roast Pork with Gravy. Not only did this exceed expectations, but make sure you grab a side of spatzle (the accompanying noodles) and load it with some rich German gravy. The station also allowed you to add a side of Red Cabbage or Warm German Potato Salad, if you’re so inclined. Lastly, we have our desserts. While the options aren’t extensive, what they do have is surprisingly well done. I give top marks to the Bavarian Cheesecake; the texture was not what I expect when I think of cheesecake, much more layered and spongy, but the difference was refreshing and the flavor was delightful. For those not pastry-inclined, there was a decent Berry Compote which I found really helps to cleanse your palate after all that sausage. The Blueberry Crumble, Black Forest Cake, and Chocolate Mousse Roulade were all solid, but they were nothing compared to the Apple Strudel, which turned out to be a favorite of Peter’s. At some point during your meal, you’ll be treated to the folksy stylings of traditional German music. As was mentioned earlier, the eatery’s amphitheater-like setup means that each table gets an unobstructed view of the stage. If you’ve been waiting patiently for an opportunity to drink to the famous “Ziggy Zaggy” chant, here’s your chance. 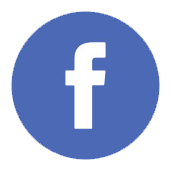 The show is performed at the perfect volume, meaning you’ll be able to sit back and enjoy, or continue conversation with friends both old and uncomfortably new. The music itself highlights various folk instruments, so accordion fans rejoice! 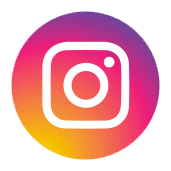 After a song or two with the full band, you’ll also have a surprisingly entertaining cowbell performance, followed by a demonstration of the mighty Alphorn (best known among American audiences for its presence in a Ricola commercial some years back). The entire set lasted around 15 or 20 minutes; enough time to add a little something extra to your meal, but not so long as to leave you neglecting your friends and food. Sometimes entertainment can take away from a dining experience, proving more to be an annoyance than a benefit, but the three of us enjoyed this brief little musical accompaniment to our buffet experience. As Biergarten is a buffet, you require less time with your server. That didn’t stop ours from being friendly and attentive though. In fact, although my first dining experience here involved a bit of awkwardness with the surrounding parties, I remember spending most of my conversational energy speaking to our German server about Orlando and her homeland. From entrance to exit, each cast member we ran across was polite, helpful, and enthusiastic. Service is a large part of what makes Disney, Disney — Biergarten did not disappoint. 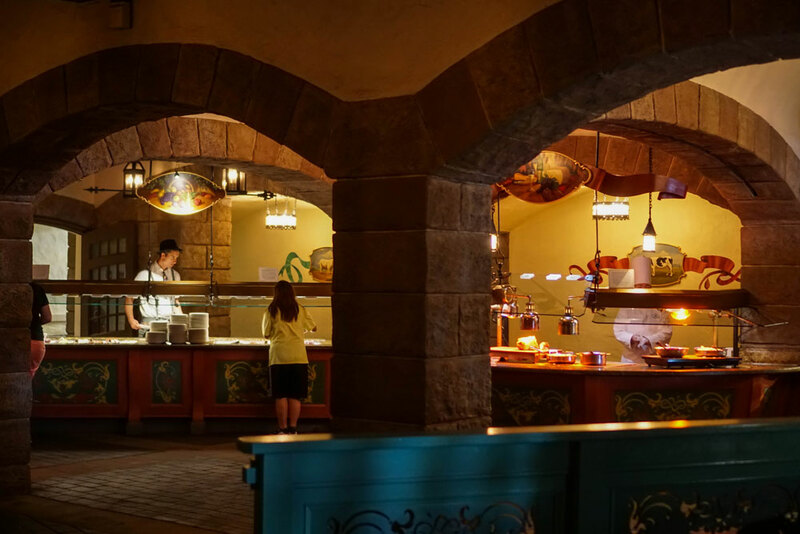 While we may have disagreed slightly over which specific dishes we preferred, we all agreed that Biergarten is an underappreciated Disney buffet experience. With the exception of the salad, no offerings seemed poorly made or lazily constructed; there seemed to be a few things for everyone to enjoy. None of us took advantage of their alcoholic drink offerings, but a restaurant named Biergarten naturally has a fine array of German beer, liquor, and wine. They serve a beer flight ($14) and white wine flight ($15) if you are out of your element and don’t know what to choose. Drinks on the menu that I’ve had at some point in the past and can confirm the value of are the Warsteiner Dunkel and Bärenjäger Honey & Bourbon. They also serve a grapefruit hefeweizen that I’ve heard folks enjoy. Lunch starts at noon and will run you $35 per adult, while dinner begins at 4 pm and will raise that price to around $60. I’d recommend filling up on a late lunch; it is an all-you-care-to-enjoy establishment, so you can really stretch the value of your $35. The eatery is 1 table service credit on the Disney Dining Plan. Factoring in those costs, the food quality, the entertainment, and the magnificent setting, Biergarten earned a 7/10 from Steve, a 7.5/10 from Pete, and a full 8/10 from me. As much as I hate to compare, all of the immersive theming that the San Angel Inn has to offer is currently wasted on poor food quality and service. Biergarten has its flaws — salad and seating — but none that detract from it enough to make you stop appreciating the picturesque environment that is this restaurant’s biggest selling point.